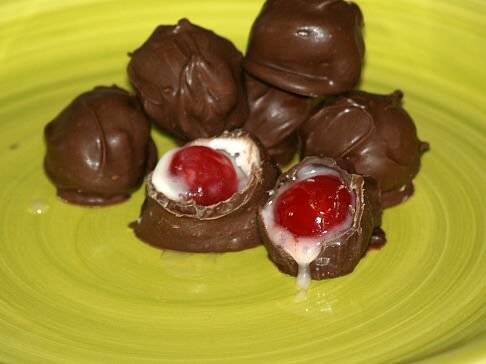 Have you ever learned how to make a chocolate covered cherry recipe? My recipe has been one of my greatest cooking discoveries. I have loved these beautiful little candies my whole life but never dreamed that I would ever be able to make them. As a child, I could never figure out how that delicious liquid got inside the chocolate with that cherry. Perhaps this is why I was so intrigued by this candy. At one of our church dinners, many years ago, a lady brought a tray full of chocolate covered cherries and set them on the table. I didn’t believe her when she said they were homemade! I asked for the recipe and she refused to give it to me. (Maybe this is why I like sharing all my recipes with you!) Anyway, I set out to find how to make these candies. No one seemed to know how to make a chocolate covered cherry back then; taffies, brittles and butter toffee were more common candies. It was hard to find anything then without the internet. We didn’t have all the cooking magazines and cookbooks then either. If we did find one, no one had excess money to buy things like that. I searched libraries and book stores several years trying to learn how to make a chocolate covered cherry recipe. I asked everyone and asked them to search their recipe books for anything similar. Finally I got a recipe! A friend called to say she found one and gave it to me over the telephone. I have copied it so many times that I don’t know what changes I have made from the original. I have been making them ever since. These are delicious! Much better than anything you can buy! They should be made at least a week or two before eating them. The fondant will magically turn into that delicious liquid. 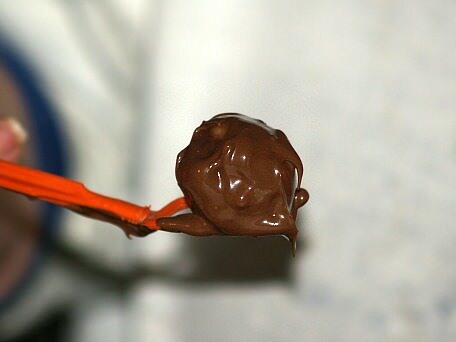 This chocolate covered cherry recipe is usually the first that I make of my candy recipes. Make one batch at a time; multiplying does not work as well. Do not rinse cherries in water; you want that good cherry flavor. Drain cherries well and place on “layers” of paper towels until ready to use; fondant does not adhere to too wet cherries. 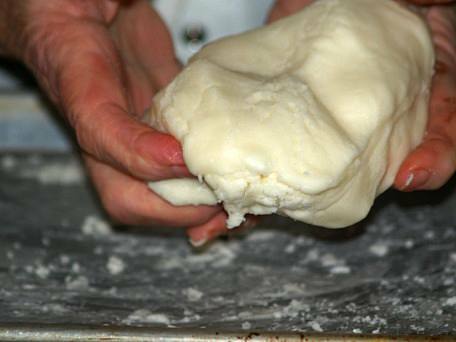 After beating cooked syrup (fondant) and warm enough to handle, knead with hands making sure it is smooth. Keep fondant in plastic wrap to prevent it from drying out while making the covered cherries. 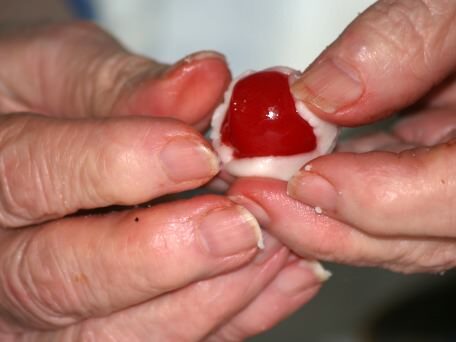 Make 1 chocolate covered cherry at a time; the fondant will dry out and fall off the cherry when dipping. Mix sugar, corn syrup and half and half in a heavy saucepan with a lid. Bring to a rolling boil. Remove lid and cook to 236F degrees (Use a candy thermometer) stirring occasionally. Pour onto a marble slab or platter and cool to warm. Add vanilla and beat until the gloss disappears and it becomes stiff enough to handle. Wrap small pieces around cherries. Dip in melted chocolate and set on wax paper to harden. Carefully, so as not to disturb chocolate, move cherries to container to store in a cool place. This recipe with the no cook fondant is much easier to make than the one above. Although this is very good, I prefer the one above. That is the very best chocolate covered cherries! Combine powdered sugar, can milk, butter and vanilla; mix and chill 3 hours or longer. Shape mixture in balls with drained cherry in the center; chill balls overnight. 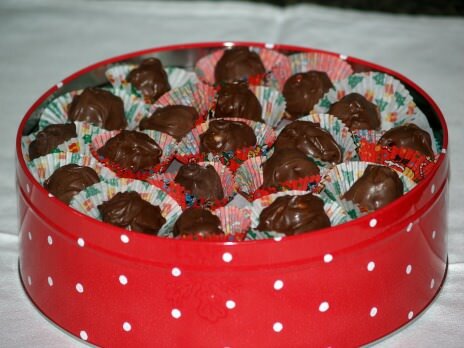 Melt chocolate chips and paraffin; cool slightly and dip cherry balls in to cover. Place on wax paper to harden. Combine and mix powdered sugar, butter, cocoa, almond, vanilla and salt; stir in coconut. Mold about 2 teaspoons mixture around each cherry; roll in crumbs and store in refrigerator. In small bowl combine cherries and rum; stir. Allow cherries to soak 2 hours; drain on paper towels. FOR FONDANT combine corn syrup and condensed milk in medium bowl. 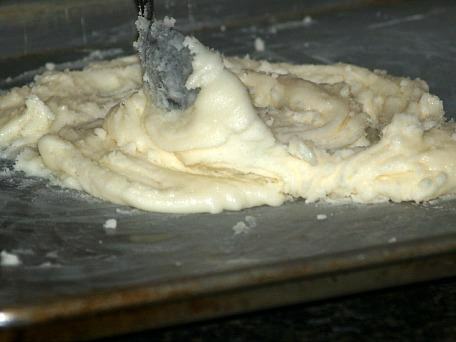 Add powdered sugar gradually mixing well to form smooth stiff dough. NOTE: Knead on surface covered with powdered sugar to make smooth. Wrap small amount of fondant around each cherry; cover completely. Refrigerate about 20 minutes until fondant is firm. FOR COATING melt chocolate in top of double boiler over low heat. Holding cherry by stem dip into chocolate making sure to cover completely. Place on wax paper; refrigerate until chocolate sets about 10 minutes. Dip chilled cherries into chocolate AGAIN making sure to cover completely. Place on wax paper; wax loosely with wax paper. Let stand in cool place for several days to allow fondant to liquefy. Store in tightly covered container in refrigerator; makes 2 ½ dozen. 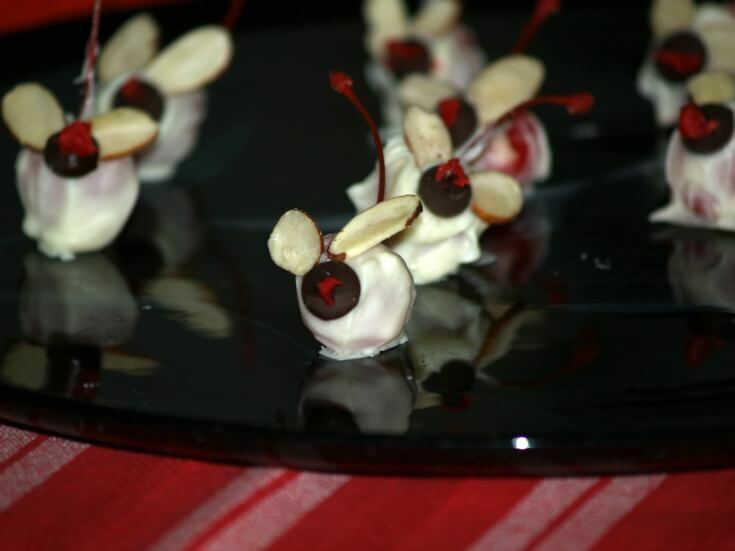 This is a very decorative chocolate covered cherry recipe. Have fun with it! Drain cherries and rinse thoroughly with water. Dry thoroughly on paper towels. Reserve 15 vanilla baking chips and set aside for faces. Melt remaining vanilla baking chips in top of double boiler over hot water (NOT boiling). 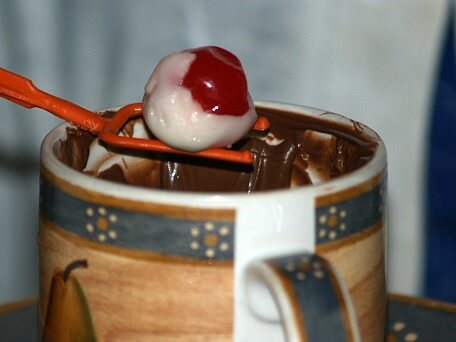 Hold cherry by stem; dip in melted chocolate and cover completely. Immediately place cherries on wax paper covered tray with stem up. NOTE: The stem will be the mouse tail. As the chocolate begins to set press 2 sliced almonds against the front for the ears. NOTE: Place bottoms of almonds together. Using remaining melted chocolate and toothpick to finish head. Spread chocolate on flat side of reserved chips; stick to bottom of ears. Add a drop of red food coloring to powdered sugar. NOTE: Use more sugar or drop of water to make icing consistency. Use toothpick to add a drop of red icing to the tip of each chip for nose. Let set until icing firms; makes 15.